These attacks come from the man who was once voted America’s most liberal governor, and who has accepted millions from public sector unions and the taxpayer-funded abortion giant, Planned Parenthood. Wolf has racked up nearly 8 million dollars from a multitude of public-sector unions and received 1.5 million from Planned Parenthood in the month of May alone. 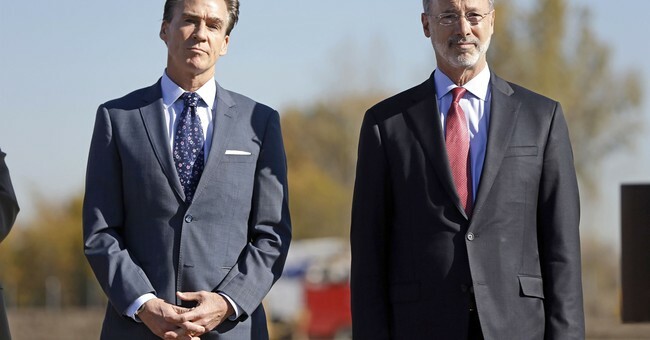 Attacks from a sitting governor may seem unprecedented given the polling touted by Wolf’s campaign, particularly a March Franklin and Marshall poll which had Governor Wolf at his highest approval rating since he took office. These pollsters have historically been left-leaning, and claimed victory for 2016 candidates Hillary Clinton and Katie McGinty. What is overlooked is the bias with the way the poll was conducted; participants self-identified their party affiliation, and those who took the survey gave Democratic identification a +10 advantage among those who participated, with 51 percent of participants identifying as Democrats to 41 percent of Republicans. The poll also failed to differentiate between voters registered and those who will actually turn out for a midterm election; the poll’s disproportionate tilt toward Democrats in those who participated is worth considering because GOP turnout has historically topped that of Democrats. McLaughlin and Associates conducted a poll among voters who tend to turn out to vote in a midterm election, producing a more accurate picture of the state of the race for governor. The results found the Wagner versus Wolf match up within single digits, with a significant portion of voters still undecided, leaving the race as anyone’s to win. Undecided voters are not only significant for a gubernatorial election, but also particularly for the Commonwealth’s contentious governor race because Scott Wagner has spent time in each corner of the state, and will continue to engage with voters, while Wolf has done little campaigning on the ground. "Running a negative ad like this as early as July shows that the Wolf campaign is panicked and the public polls are wrong. Tom Wolf's harmful tax and regulatory policies have Pennsylvania's economy in the tank compared to the country as a whole, he's for an education plan to cut funding from 362 schools and he's no longer committed to property tax reform. It's clear he thinks his only saving grace from that failed record will be to bombard the people of Pennsylvania with ridiculous attack ads that not even the Senate Majority Leader of his own party agrees with," Wagner’s Communications Director Andrew Romeo said in an email. Governor Wolf’s spending on attack ads insinuate that the Pennsylvania gubernatorial race is still competitive. The first-term governor’s criticisms of his GOP opponent’s campaign donations are nothing short of hypocritical--Wolf has been in the pocket of public sector unions and has accepted money from Planned Parenthood since he took office in 2015, and these groups funnel money almost exclusively to Democratic candidates on the dime of the Pennsylvania taxpayer.